Sugar Chef is not the least expensive or most expensive bakery you will find, just like a Mercedes is not the least expensive car you can buy. When shopping for a wedding cake (or any item), the adage of “you get what you pay for” comes to mind. We will ALWAYS try to accommodate every budget, but Sugar Chef simply cannot compete with every bakery due to our commitment to the quality of ingredients, and attention to detail in your wedding or special occasion cake. Sure, Mercedes could build a cheaper car, but then it wouldn’t be a Mercedes anymore. 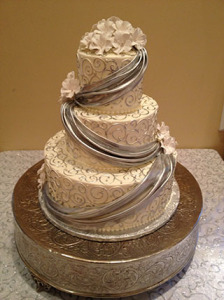 When it comes to wedding cakes, cupcakes and special occasion cakes in South Florida, Sugar Chef delivers only the best. We are happy to suggest alternative designs to save on cost, and we offer discounts when you purchase more than one item. At Sugar Chef, we make every component of your gourmet cake by hand, spending as many as 30 hours on a single wedding cake, and then we include a one hour design meeting, and delivery. Is all that worth $5-8 per person? Considering that many restaurants charge similar prices for cakes made cheaply in an offsite location, we think so. Sugar Chef is proud to count among its clientele some of the most discerning hosts in the business, and to have built this prestigious list of clientele from personal referrals. Recognizing that design possibilities are limitless, Sugar Chef will provide a customized proposal that details the order and options. The Sugar Chef promise is exquisite attention to every detail and to exceed the expectations of our hosts. 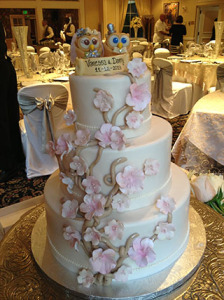 Sugar Chef is happy to help you design a cake perfect for your event or to recreate an existing design. Unlike most pastry chefs and storefront bakeries, Sugar Chef can replicate almost any design or nuance, or start completely from scratch to make your vision become a reality. Sugar Chef’s cakes will not be found in any store. Sugar Chef’s gourmet cakes include only the highest quality ingredients available in the world. To guarantee Sugar Chef’s trademark flavor profile, we will never substitute with a lesser quality ingredient. Every cake produced in our certified kitchen bears a signature look for our host and a signature flavor profile unique to Sugar Chef. 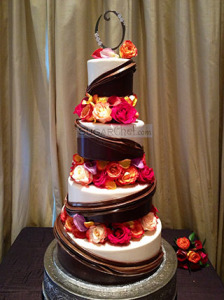 Sugar Chef’s decades-honed skills have redefined the paradigm of the “traditional” wedding cake. Every hand-crafted Sugar Chef cake is the product of years invested in ingredients selection, the perfection of favorite recipes, and in the creative presentations worthy of your event centerpiece or memorable keepsake. From our in-store consultation and tasting experience, to cake design, baking and decorating, and finally to hand-delivery and set-up of the cake to your event, you will deal personally with Kate or her well informed staff. 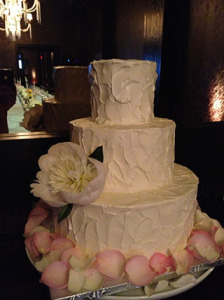 Sugar Chef wedding cakes and special creations are hand-crafted in a health-certified and insured Florida food production kitchen that is consistently inspected to ensure it surpasses sanitation guidelines. Birthdays, baby showers, christenings, bridal showers, rehearsal dinner cakes, anniversaries, bar/bat mitzvahs, quinceanera cakes, and corporate events represent our most requested custom cake orders. For these and any other landmark celebrations, Sugar Chef’s edible art commemorates the celebration with a cake uniquely designed for the occasion and the guest(s) of honor. Special occasion cakes begin with a base price of $3.25 per guest for cupcakes; and cakes starting at $5 per person (less than what you would spend on a cocktail). This includes a smooth Buttercream finish, occasion-specific borders and decorative piping. Rolled fondant, handmade flowers, accents and customizations may be added to our client’s delights. Elaborate decorative piping and fondant detailing. Three-dimensional characters and specialty shapes. We require a 50% non-refundable deposit to secure your date. Final design and flavor details due 2 weeks before event. Payment in full due two weeks before event. Cake prices start at $5 per person with no minimum total order. Sugar Chef is happy to deliver to the tri-county area—Palm Beach, Broward, Miami-Dade, and beyond! Delivery fees are determined by the distance, time and set up requirements.